PRETORIA, South Africa (AP) — The firing of South Africa’s respected finance minister on Friday sent the currency tumbling by close to 5 percent and brought fresh anger at President Jacob Zuma as a split in the ruling party deepened. The country’s main opposition party said it will challenge the move in court. Zuma’s replacement of Pravin Gordhan came as part of an overnight Cabinet shuffle that changes 10 of the country’s 35 ministers. The new ministers will be sworn in later Friday, but the opposition Democratic Alliance said it would file an urgent request in the Western Cape High Court to halt it. Many South Africans have seen Gordhan as a responsible steward of an economy that now could be downgraded to junk status by credit ratings agencies within days. His firing is another blow to Africa’s most industrialized economy that grew just 0.5 percent last year and suffers from 27 percent unemployment. Pressure has been growing on Zuma to step down after he recalled Gordhan, who has a strong reputation as a bulwark against corruption, from a trade trip in London earlier this week. Deputy President Cyril Ramaphosa, seen as a likely candidate to succeed Zuma as the ruling party’s leader at its conference in December, called Gordhan’s firing “unacceptable,” broadcaster eNCA reported. Gordhan is being replaced by Malusi Gigaba, a former home affairs minister. Gigaba, who was criticized for introducing draconian visa rules that crippled South Africa’s tourism industry, has little experience in economics. Dozens of protesters gathered outside the country’s treasury, where Gordhan told reporters it “sickens me” that he had been accused of holding secret meetings seeking to undermine the government. Gordhan’s firing “can have quite significant negative impacts on the economy and on policy in the short term. In the longer term, however, it may lead to the downfall of Zuma and his patronage, which will certainly be a good thing for South Africa,” said economist Dawie Roodt. The Cabinet shuffle comes as the calls for Zuma to step down grow. “It is parliament who hired Jacob Zuma and it is parliament that can fire him,” said Mmusi Maimane, the leader of the Democratic Alliance, which on Thursday said it would launch a vote of no confidence in the president. Frustration has been growing with Zuma after numerous allegations of corruption. On Wednesday, Gordhan inspired a standing ovation at the funeral of one of South Africa’s leading anti-apartheid activists as longtime leaders of the ruling African National Congress, the country’s former liberation movement, called for Zuma to step down. The outcry by funeral-goers including the ex-wife of Nelson Mandela, Winnie Madikizela Mandela, further exposed the ruling party’s divide. Even allies of the ruling party had warned against replacing Gordhan. Deputy general-secretary Solly Mapaila of the South African Communist Party warned Thursday that the party’s seven Cabinet members would resign if Zuma fired the finance minister. Also Thursday, the Economic Freedom Fighters opposition party applied to the country’s highest court to order parliament to begin impeachment proceedings against Zuma. The EFF called it “a last resort,” with party leader Julius Malema accusing the ANC-dominated parliament of failing in its duty to hold the president accountable. The scandal-ridden Zuma in November survived an attempt by senior party members to oust him as president. South Africa’s highest court last year found that Zuma had violated his oath of office by refusing to abide by an order to pay back some of the millions of dollars in public money spent on upgrading his rural home. 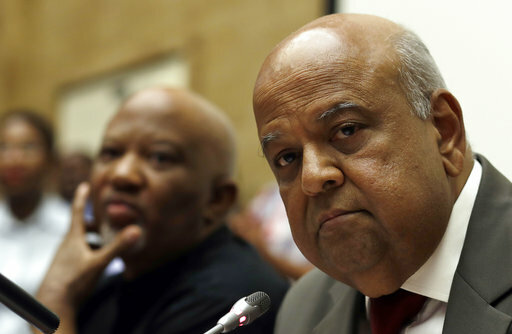 Gordhan became South Africa’s finance minister after Zuma’s abrupt decision in December 2015 to fire Finance Minister Nhlanhla Nene and replace him with a relatively unknown figure unsettled markets and prompted a national outcry.